The three lettered poisonous word which became such a challenge to co-operation and being we relationship is an EGO. All relationships have problem because of EGO, with spouses, with friends, with parents, with colleague. All relationship issues the WE is tightened by the three lettered word called EGO. One religion man is thinking that I am better than you and the other is thinking I am better than you. What a hell is going on here in this world? In the field of religion people became victim of EGO and have communion of conflict. Have we not understand that we are dealing with the same father, the same God and be able to resolve the communion fight and communion conflict which of all course by nothing but a mere said EGO. We get grown up because of our practicing and thinking. The world is witnessed so much conflict. Relationship fall apart only because of this EGO. 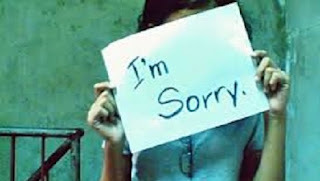 SORRY is a magic word when genuinely spoken from the heart. This word is a magic word. You pray for to save the person than being right. You pray for the relationship than being right. You are willing to keep the EGO aside and transform that EGO into humility. Do you know that a man who says sorry when he is wrong is called HONEST? And A man who says sorry even when he is right is called HUSBAND. A lot of conflicting situations come because of the EGO and therefore, the most poisonous THREE lettered word is EGOlet us transform it into HUMILITY. saying sorry is easy. it's admitting that you're wrong that is hard. even harder when you have to make up for it. I tell my wife I’m sorry all the time, even when I’m right haha.